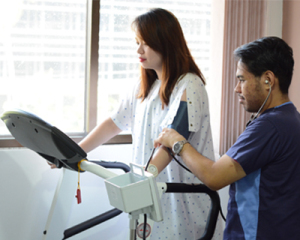 The Center offers physician-directed cardiac rehabilitation with progressive exercise programs to help and guide patients to recover fully from heart attack, coronary angioplasty, coronary bypass surgery or other serious cardiac events in a safe and comfortable environment. Programs involve the active participation of the patient’s primary attending physician and a rehabilitation cardiologist. Physical therapists and nurses supervise and monitor a patient’s exercise progress to ensure the safety and efficacy of the individualized rehabilitation program. Continuing patient medical education about their condition is regularly provided by the staff to enhance the patient’s participation and commitment towards achieving a healthy lifestyle.